When I was first contacted by Shawna Eikenberry, she and I spoke about her dream of doing Ironman Louisville (IMLV) in August 2014. We discussed an ongoing chronic injury that was prohibiting her from running, plantar fasciitis. It was so debilitating Shawna couldn’t run more than a couple miles without pain. She had seven months to build up to IMLV. As a personal trainer and a coach, I always incorporate strength training and prehabilitation – preventing injury before it occurs. After discussing different options, she went to an Active Release Technique (ART) specialist on a regular basis. For training, we focused heavily on cycling, swimming, and the use of the elliptical trainer to substitute for running during the base phase. Even though she wasn’t running, she kept her heart rates zones in base per the program on the elliptical, which was building her strong foundation. Another big focus was strength training. I gave her specific strengthening exercises that would help correct any imbalances or over compensation due to the injury. In addition to tracking her distances and hours of training, Shawna tracked her metrics, such as weekly weight, weight pre/post workouts, and sleep, to get an overall picture of her fitness gains. Shawna was great at uploading her data and adding notes, and within two months I could see her endurance on the bike had improved greatly. Around February, she indicated marked improvement in her plantar fascia. We started with a conservative run/walk program, building the run/walk ratio over time. She continued the strength work and ART throughout training, and realized how prehabilitation is paramount to healthy training. March and April were breakthrough months; Shawna was beginning to run an hour or more at a time pain free. She continued to train hard and balance her schedule as a lawyer, wife, and mother of two children. Shawna put in her family functions and indicated what days were best for the longer training day so I could work around her busy schedule. When she had to move workouts around I could review the slightly altered week of workouts to ensure that she was still getting the benefits of all the training, but also made it work with her schedule. I wanted her to do a half Ironman distance event during the season, so we looked at Ironman Muncie 70.3. It was spaced well at six weeks out from IMLV, and would still give her time to build an even stronger run. By the time July arrived, all of the training data and Shawna’s own feelings showed that her swim and bike were incredibly strong. She had been running pain free up until this point, had completed a couple running races to test out her progress, and was ready to give it a go. The initial focus on her swim and bike allowed her to emerge from T2 in 7th place in her age group and I was able to provide her pacing guidelines by utilizing the accumulated data throughout her training. 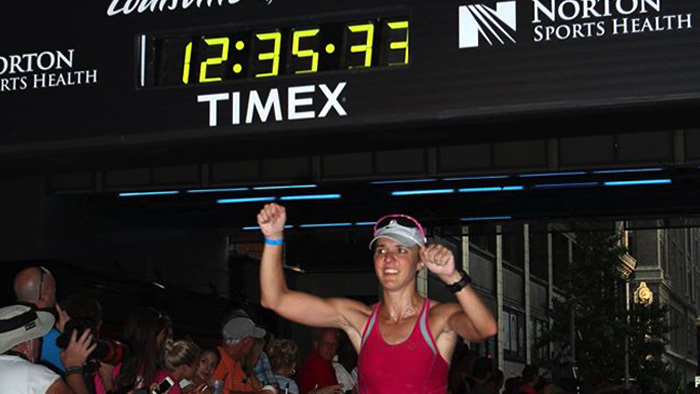 She completed a 2:05 half marathon, only about three months after restarting her run training. She ultimately finished 12th in her age group! Throughout the macro training blocks, Shawna carefully noted her nutrition and hydration intake. Here we were able to see from her sweat rate analysis done earlier in the season if she was hitting her optimal hydration rates. We were also able to determine what types of fuel mixture worked best on the bike; each person has different preferences and physiological needs. As she progressed through her cycles of building and active recovery, Shawna was able to completed several century rides and her long runs pain free, one consisting of a four hour run/walk, which is significantly less stressful on the body versus running 18 to 20 miles, but also trains the mind to deal with the mental stress of an Ironman distance event. In Shawna’s case, this was ideal because she could mentally and physically feel what it was like to be out there that long run/walking. She covered over 20 miles with no pain and with limited recovery. Three weeks out– she was ready. Through her daily notes I could also sense the nervousness and self-doubt that was starting during the last three weeks leading up to IMLV. We developed her mental strategy. The big goals of her race plan were simple – keep her heart rate at a certain level on the bike based on her fitness level; we knew it would be very hot in IMLV, so I developed a pacing plan for the run. Race day arrived, and I tracked her all day via online updates from the Ironman website. I knew she would emerge from the water near the front of her age group based on her swim background and the initial focus on the swim, and came out in 7th place. She stuck to the physiological parameters set out in her plan, and had an incredibly strong bike, she held her place and emerged from T2 in 8th. At this point – I knew it was very possible that she could have a shot at qualifying for Kona, depending on the roll down and number of slots in her AG. I was fortunate enough to be able to provide live updates and real-time guidance related to a cramping issue on the run to her husband, who was on the course relaying my guidance. She ended up surpassing her best expectations and finished 9th in her AG, with a first time Ironman of 12:15:23. With a steady 11:42 pace on the run, during what was a scorching hot day, she finished strong, smiling, and she was able to run 100% injury free. Shawna’s patience, hard work, trust in the plan, diligence in communicating her progression to me, along with her sheer determination truly embodies what it takes to make her dream of racing under the full moon on the Big Island a reality. Kamden Hoffmann, PhD, is a USAT Level I Certified Coach, Personal Trainer and competitive'triathlete. Based out of Raleigh, North Carolina, Kamden coaches a wide array of athletes, from beginners to advanced triathletes and runners. She puts an emphasis on injury prevention through'pre-habilitation (working on strength training to prevent injury before it occurs) and balancing'training with one's personal life and work. Kamden received her BS from Tufts University and'her MA/MPH from the George Washington University. She received her PhD in Community and'Behavioral Health Science, with a focus on physical activity for disadvantaged and marginalized'populations in the Pittsburgh area. She is the co-founder of KaMOTION, http://kamotion.us, a'multi-sport and personal training company that provides one-on-one and virtual coaching based'on the athlete's needs and abilities.